Four stringed instruments made from the wood of a tree at Sir Arthur Conan Doyle's childhood home are to be played in public for the first time. As a child, the writer of Sherlock Holmes climbed a sycamore tree in the garden of his family home in the Liberton area of Edinburgh. The tree was felled two years ago, after becoming diseased. 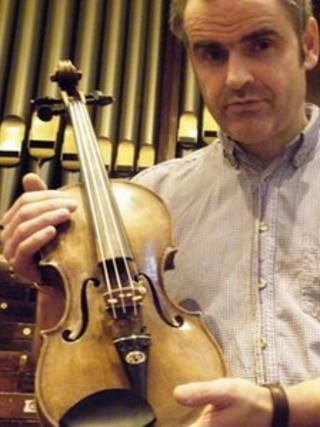 Instrument maker Steve Burnett was commissioned to use some of the wood to produce the "Sherlock violin". Conan Doyle's literary detective creation often played the violin, a talent he shared with his creator. Now Steve Burnett has made four more instruments, another two violins, a viola and a cello. They were being played in public for the first time at a Concert for trees in Edinburgh's Usher Hall on Saturday night.